What is the Inquirer’s game? My general impression for some years has been that, of all the nation’s newspaper publications, the Daily Inquirer is the best, the most respected and popular. It offers broad news coverage and appears to have no discernible axes to grind. The newspaper does work the sensationalist angle to boost circulation by emphasizing scandal or conflict in big bold headlines, as do most of the Philippine media. This has the unfortunate consequence of showing the Philippines to its citizens as a nation under constant strife. Stability is what the nation needs to do good works with a minimum of interference, to keep the economy growing and to attract travelers and investors. It seems to me the columnists in the Inquirer Opinion Section are the best in the Philippines, as a group. But I must say, my ideas about the Inquirer’s integrity were shaken the other day by one editorial that took the Aquino Administration to task for slow response to Yolanda (see “The real score“) . Well, you should know that I am suspicious of those who take Israel to task for bloodletting whilst failing to mention the rockets Hamas aims indiscriminately at Israel civilians. So when a Philippine publication takes to task the national government without mentioning the local government shortcomings in preparation and response to Yolanda . . . well, I think something is amiss. So I became puzzled in reading the editorial which was unsigned by an author, thereby representing the paper’s official view. Well, like three cherries riding into alignment on the slot machine window, clink, clink, clink, I drew a very unkind conclusion on why that editorial was so one-sided. The Inquirer’s CEO, by marriage, is a Romualdez. Imelda Marcos is a Romualdez. The Marcos clan salivates about getting back into power. They would fall into the category of critics to be wary of. Wolves in sheep’s clothing. The Daily Inquirer, Inc., is a privately held company with a majority of the stock likely held by Marixi Rufino, ranked in 2007 at number 39 on the Forbes list of the richest people in the Philippines. Her net worth was pegged at US $33 million at that time. Wealth came from ownership of banks and real estate. The Rufino family is labeled by Wikipedia as “an influential dynasty of business owners, politicians, and philanthropists in the Philippines”. Her husband is businessman Alejandro “Alex” Prieto. It was also reported that Indonesian businessman Anthoni Salim, who owns 100 percent of the Philippine Star and 100 percent of TV-5, among other Philippine properties, also owns 18 percent of the Inquirer. The story of how a foreigner acquired such dominant ownership of Philippine media is a separate matter to be examined, and is profiled in this story: “How Salim group skirted foreign ownership limits“. The Publisher is Raul C. Pangalangan, distinguished lawyer and professor of law at the University of the Philippines College of Law. He was among the 22 Supreme Court nominees that was eventually narrowed down to Chief Justice Sereno. But even if Medina deviates from the editorial position of the Inquirer, he has no reason to fret. The dean of the Inquirer’s corps of cartoonists, Jess Abrera, has differed fundamentally with many of us in the Inquirer on the issue of reproductive health, and to this day continues to draw his anti-RH editorial cartoons even while the editorial and certain columns cheer the passage of the RH Law! Anti-RH, anti-poor and anti-women, December 7, 2012. A powerful pro-RH Bill dissection of the opposing arguments that played up human rights and downplayed the population growth argument. Purging the (party) list, October 26, 2012. This was Mr. Pangalangan’s last editorial column before moving into the Publisher’s office. This quote identifies the main theme of the article: “We must confront the fact that we the sovereign people have failed to maintain quality control over the party-list system . . .” And so he confronts it. ‘Freedom for the thought we hate’, August 11, 1011. This is essential reading for any citizen who wonders what “freedom of speech” really means. He deals with seven fallacies about free expression. Regarding the first, he says:“The fallacy [that offensive expression can be censored] puts democracy above liberty, and leaves marginalized minorities at the mercy of the frenzied mob.” The rest of the article is equally instructional. Other ‘Passion for Reason’ articles can be found via this link. This blog is quite long enough already, so I leave you to your ways. Frankly, I like this man’s journalistic integrity, his thinking and his writing. The President is Alexandra Rufino Prieto-Romualdez, a businesswomen and philanthropist. She is the daughter of Daily Inquirer Chairman of the Board, Marixi Rufino, and businessman, Alejandro “Alex” Prieto. Ms. Prieto-Romualdez is married to Philip Romualdez. He is nephew (possibly grand nephew; genealogy charts are not clear on that point) and a cousin, at some level, of Alfred Romualdez, Mayor of Tacloban. Tacloban is the large Leyte city that was destroyed by Typhoon Yolanda. Imelda Romualdez, a singer and beauty contest winner, was known as “the Rose of Tacloban”. Alfred Romualdez and the Aquino Administration have been in a bitter blame contest regarding Yolanda rehabilitation. The stated corporate mission of the Daily Inquirer is most noble, both for its brevity and its high-minded expression of integrity. Well, blasphemy not of God, but of the idea that news is objective and the press is not supposed to MAKE the news. Here is a headline that ran in the inquirer.net on August 12, 2014. The tenor of the headline is consistent with the theme of the editorial I explained above. The amazing stretch on this one is that the headline presents EXACTLY THE OPPOSITE MEANING of what the article content reports, that the Yolanda region has its own P22 billion budget for storm re-building. In other works, the Yolanda-hit region IS being cared for. The headline creates the continuing impression that government is beating up on Yolanda victims. Did this headline emanate from the President’s desk? Does the paper have a theme, a trend, an agenda that is consistent with the Marcos/Romualdez point of view, over that of the Nation? Is this a kind of quiet political subversion taking place, beneath the public’s radar? Publisher Pangangalan would argue that even views we dislike ought to be published. Yes, yes, that is true and good. But OPINION goes in a special section of the publication that is properly labeled as such. The news by all reputable journalistic ethical standards is to be factual and objective. Not distorted to manipulate the public’s takeaway. When news is manipulated, the publication is engaged in MAKING the news, being an advocate. And when it is done on the sly, under cover, how horrendous. Perhaps the Mission Statement should be revised to state that the Inquirer backs the Marcos dream of return to power? Or the Romualdez dream of . . . of . . . getting even? Do you want to know why President Aquino’s popularity rating has taken a hit? It is because of an overabundant accumulation of sly, deceptive, shrill, crab-like news articles, with the press engaged in the making of the news. How can we retain confidence in the publication . . . the entire Inquirer product . . . if it is allowed to game the public on even one story line? If it is allowed to MAKE the news by harboring secret political ambitions and writing its opinions and NEWS articles to support those ambitions? If that is the case, the paper is no better than Fox News, touting its fairness and delivering something quite different. It is a rag. A political rag, gaming its audience. Well, the intrigue is that Publisher Pangalangan is bracketed by the mother and daughter, the Owner and the President. What a delicate position to be in. It plays out like a television drama, prime time. I don’t have access to back issues of the Inquirer to scan other Yolanda news articles and editorials, so I admit my evidence is scant – two articles and a family tree. I will be reading the newspaper in the future with this in mind, and with some new measure of wariness. My hope is that the Inquirer is not taking the path of Fox journalism or tabloid journalism and giving it’s high-minded mission statement the heave ho. Or using it as high-minded cover for a scurrilous political agenda. The Philippines needs a strong, globally recognized newspaper. It does not have one. The Inquirer is best positioned to be that paper. It will never get there if the main description attached to its work is “sneaky” or “underhanded” or “political rag”. ← Have Filipinos sold their souls to family bloodlines? And Mr. Aquino? The inquirer started out as one of the few newspapers during the end days of the Marcos regime who openly defied the dictatorship. It was instrumental in helping people power overthrow Marcose. How ironic that now it would defend the Romualdezes. I personally know some of the Rufinos and they are nor politically inclined to support the Marcoses but that’s another story. I’ve been reading the inquirer since the 80’s and i can conclude that its objective is first and foremost is to sell. I started to notice their bias reporting when it came to the murder case of Hubert Webb (who was eventually acquitted by the supreme court). Its a case I took special interest in because he was a schoolmate and I had friends who saw him in the US when the alleged massacre took place. Since then, I was weary about their news reporting and have noticed their sensationalist slant. I can’t say there is an ideology or a political slant in the paper, i just feel they want to be sensationalist and tabloidish just to sell more. Dignity or politics. The publisher is dignity. The owner is dignity. Being a mouthpiece of the Romualdez/Marcos tribe is not. Afterthought. I wonder if there is not more money to be made in moving away from tabloid journalism to become the go-to paper for respectable readers and advertisers. Hire a couple of good features/investigative writers and start putting some brains into the front page to appeal to the growing, increasingly wealthy middle class, and global markets. Separate from the tabloid press that is everyone else. Ahahahaha, plus, I hate the color orange . . .
Special mention to reporter gil cabacumgan who always puts a negative spin to what should be a straightforward news report. Just like what he did when he accused an ngo of one of pinoy’s sisters of being a recipient of dap funds. Joe, this is really good you are taking a hard look at the Inquirer. Thanks, Bing. The pair of articles were certainly eye-opening. I can imagine a Marcos presidency backed by its own national mouthpiece newspaper . . . a very bad dream. Well, all these newspapers are after the income, hence the news Headlines were selected to attract people in buying their news. Some Headlines are “PAID” in full, 3 times or 5 times maybe 10x more than classified ads by Rich corrupt personality. I can say, none of these NEWSPAPER industries are true to their fair policy news, money talks, if one corrupt person paid the required 100k php per line, that will be published or just like political dynasty or family affair, one can get his desire or wish propaganda printed. Headlines and its contents are 50% true and 50% lies to attract people. The only pages that are near 90% true are the comics section, sport pages and classified ads. With the current technology, the owner and publisher of newspaper had to revise their policies in order to sell, venture in the internet news with the thought of selling still or earn via advertisement. One of these days, the social media will totally replace newspaper. Cyber criminals paid by opposition can easily destroy government good credit by creating fake web pages of the government doing economic sabotage and alike. Perhaps, one look-alike PNOY doing a sexual scandal video on FACEBOOK (FB), or a look-alike of Kris Aquino doing scandalous act on video pasted on a fake account in FB. That is why, punishment for this type of crime should be death penalty by hanging to included in FOI Bill. Money is the root of all evils, I can say, Philippine with its strong family ties breaks the spell. Not all family members are evil, someone, somehow among members will oppose the devilish relative. Perhaps social media will not just become a main source of information, but a force on mainstream media to clean up their act. Put that together with a newfound sense that honor can be found in upright deeds rather than conniving for success, and who knows. 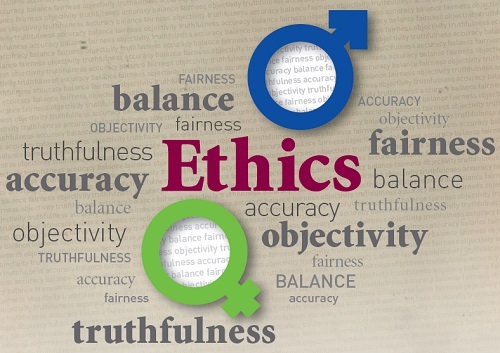 Maybe journalism will develop a new set of ethics, too. Money is a corrupting force, for sure. But I think it can be made honestly in journalism, without blood and gore marketing. I hope so. I noticed a bit of disappointment/frustration in this blog. It could be that you were in the Philippines during the Marcos years and therefore appreciate what the Inquirer did at that time as the leading alternative news medium. Those years, if I may say this, were that newspaper’s greatest years. Over the years, since the Apostols got out of the newspaper publishing business, allowing the Prietos to take over, the paper changed. The same can be said of The Philippine Star when its publisher, Betty Go Belmonte passed away. These newspapers became tools of Philippine big business. Today, the newspapers serve their owner’s businesses first. 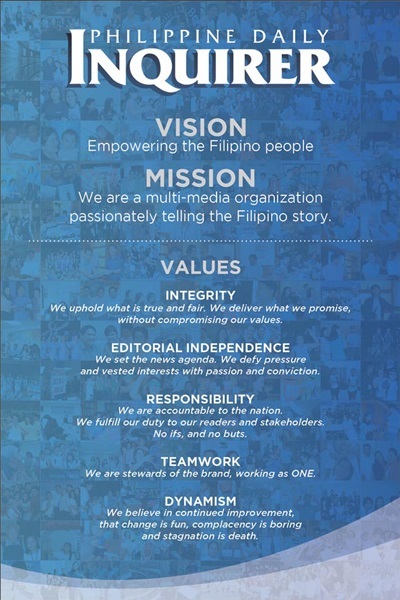 Inquirer is owned by the Prietos. Well, to put clearly, the Rufinos. Yes, the Rufinos of local banking, finance and real estate. The clan is also in the food retail franchising game through Golden Donuts, Inc., erstwhile local operators (if not still), of the Dunkin’ Donuts franchise. I read somewhere that GDI tried to have its own chain when the franchising arrangement ended but got in trouble because of copyright issues concerning logo use. I have yet to confirm this whether it was settled or whatever. Also, GDI is being assessed by the BIR for tax deficiencies in the hundreds of millions. It has also been reported that the Rufinos are affiliated with Donald Trump in a development project. The same situation may also be gleaned from the revised ownership of The Philippine Star. It may be true that the Salim Group, through Manny Pangilinan, has control of its operations. Pangilinan has been salivating over local media companies for a long time. It is true that the Inquirer may lose its standing as an independent newspaper, or it may already have or this blog may not have happened. For now, the Rufinos do not care. That paper will be out there for so long as it serves it’s business purpose – protecting and advancing their interest. I just wonder, what would happen to its stable of writers (most of them are reputable) if and when the paper folds up? Inquirer folding up? I find this a happy thought. The new alternative media is now around; joam is out there, raissa’s out there and a host of others and these guys possess a different kind of zealousness. It’s tempered by facts and search for truth. The frustration and disappointment on my part has to do with a set of personal ethics that finds using journalism for ulterior aims – to make money or advance political aims – extraordinarily distasteful. I feel the same about US media . . . but there there are still honorable journalistic efforts within the umbrella of making money. But even that is eroding as making money through paper newspapers is getting very hard to do. And to think of the Inquirer, a publication that I generally respect, as a mouthpiece for the Romualdez/Marcos clan, a group that I dislike immensely, is both frustrating and disappointing. I do appreciate your optimism that the shortcomings of these popular media can be filled by internet research and reporting. I hope so. I must confess that I have some misgivings there, too, when I visit discussion threads of the popular press and see the inane, offensive, troll-filled commentary that is prominent there. But clearly, the era of Cronkite journalistic integrity is dead. Was discussing Yolanda rehabilitation with an officer of a major NGO involved in building houses for the victims. Was told national government is doing everything it can to help the victims. What’s stalling the effort is the lack of available lands to build the houses on. Strange since it is Romualdez country and they presumably care enough to find the means. Contrast this with the Javiers who donated their own land to the victims in their area (Javier, Leyte). Thanks for crusade on ethics in media. Thanks, Maria. And it is interesting to me that Tacloban has the wherewithal to pour cement to widen the road for the Pope’s visit, but not to make hollowblocks for the homeless. I think the Pope will be ashamed if he finds out, frankly. That headline ‘Mindanao gets higher share in infra budget than ‘Yolanda’ hit Visayas’ insinuates that there is some favoritism in Congress when they appropriated a smaller amount to the parts of Visayas badly damaged by the typhoon. Or maybe Congress erred in its estimates of the budget to be allocated in those regions. Whatever, it is not surprising that such a comment from Maria Socorro would involve the Romualdez clan as they own Tacloban and maybe the neighboring towns as is most common in almost the whole country – clans owning whole towns or even provinces. The Inquirer is slowly losing its credibility as an independent newspaper since the former owners/publishers sold it. The buyers were so interested because the real owners want to control the media in preparation for their return to power. The connections and the intentions are not hard to imagine. That’s my real fear. A party-controlled top-rung newspaper manipulating public perceptions. I agree with reader Adrian Cuenca’s assessment that PDI is not ideological. But the paper is not just the owners; it is composed of the writers, reporters, editors, etc and I think the paper strives to maintain both populist/sensationalist features as well as the more balanced, serious stuff. What I would like to see is how the Inquirer behaves if Philip Romualdez pushes through with his Senate candidacy. Most likely, that will be the mining lobby. And also, if some readers can confirm/deny this, as I do not monitor it: how does the Inquirer treat mining stories? Ahahaha, I think you can become “CMS” for the Society. Chief Media Specialist. We issue medals, and Kevlar helmets . . . I heard an AM radio commentator call them “kulam-tators”. Anybody here still reads Kit Tatad or listen to what he says? I agree. Although I think readers are partly to blame. Most would react immediately without reading the entire content. That’s a good point. Opinions are formed quickly and held without bending. I find the Romualdez family as typical of the dynastic hold incumbents have on local government. It is hard to root them out. No one wants to oppose them, I suspect because they can be down and dirty players. The arguments aren’t intellectual at the microphone, but bitter at a personal level. People hurt, lives ruined. Threats, intimidation. Tending toward nasty. Fear plays a big part in their success. Strange way to be popular. Thanks for the background on ABS-CBN. Have a look at how the different news outlets, Inquirer included, covered yesterday’s anti-pork protest (headline-wise) and you see which ones strive towards being factual in their coverage and which ones would rather twist the facts to get their own angle on the story. A round of applause for those who called it as it is. Nice try, to all the rest. The Daily Inquirer walks on thin ice. . .
together, consequently make sure that she uses them all.